Download "Accurate cheque writing When writing or accepting a cheque, ensure that all details are correct to avoid unpaid cheque Charges." 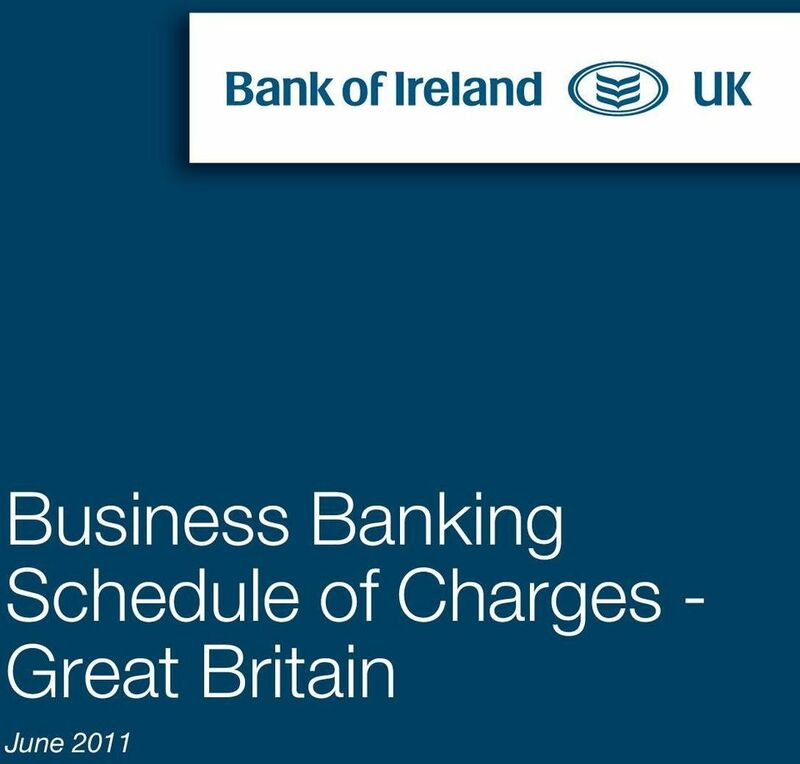 2 Introduction Bank of Ireland UK offers many free services, but where Charges are applied this fact sheet explains them and how it is possible in some circumstances to minimise them. How to keep Charges to a minimum You can minimise any Charges in the following ways: Electronic Funds Transfer Automated transactions cost less than manually processed paper ones, so do as much of your banking as possible in this way. BACS (Bankers Automated Clearing System) allows you to make payments, like salaries and wages, and pay invoices automatically. We offer two ways of accessing this system: - Business On Line - an on-line desktop banking system. Installation, onsite training and monthly access are all free. Bulk payroll/creditor payments via BACS are charged at 12p per individual transaction, compared with 71p to issue a cheque. - Business Pay - a fax based system for paying your employees via BACS. Please ask us for details and an application form. If you choose to use a non Bank of Ireland UK bureau to process your creditor/payroll payments, certain Charges will apply. 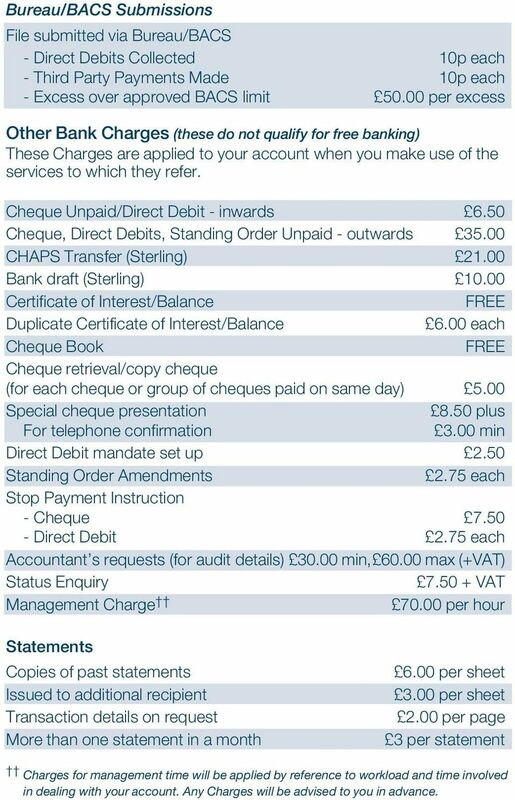 Our BACS Charges are set out below. Operate your account within the authorised overdraft limit If you have an overdraft with us you should always operate your account within the authorised overdraft limit. If you know that it is likely to be exceeded, even for just one day, discuss a temporary or permanent increase of your overdraft with your Relationship Manager in advance. We will debit your account with any costs and expenses we incur if you exceed your authorised limit. Accurate cheque writing When writing or accepting a cheque, ensure that all details are correct to avoid unpaid cheque Charges. Keep all statements and documents By retaining statements and documents you can avoid Charges for duplicate copies. They are costly to provide. We will be happy to tell you more about Business On Line and BACS and suggest how best to minimise your Charges. Pre-notification You will be notified in writing at least 14 days in advance of standard Charges and debit interest Charges to be applied to your current account. Standard Charges and debit interest are calculated monthly in arrears. They are calculated up to and including the 4th of the month, or the preceding Business Day, and will be debited to your account on or around the 30th of the month. This applies to all customers receiving pre-notification of Charges and debit interest Charges to be applied to their current accounts. 3 Business On Line bulk payroll/credit transaction Charges are billed quarterly in arrears and are calculated up to and including the last day of the quarter. You will be pre-notified of Charges 14 days in advance and they will be debited from your account on or around the 1st day of the following month. Business Pay Charges are billed quarterly in arrears and are calculated up to and including the last day of the quarter. You will be pre-notified of Charges on or around the 4th of the following month and they will be debited from your account on or around the 16th of the month. Standard Current Account Charges These are Charges associated with the normal conduct of your current account. They are applied monthly* for transactions processed and include a maintenance Charge. Please check your Charges each month. If you have any queries please contact us to discuss them. Account maintenance 5.50 per month Per item Lodgements 66p Credit transfers into Account 66p Branch Debits 75p Auto Credits - in (BACS, Standing Orders, CHAPS) 26p Auto Debits - out (Direct Debits) 45p Standing Order - out 55p Cheques paid in 39p Cheques issued 71p ATM Debit 75p** None of the above standard charges apply for the period of free banking on an account (if applicable). Charges when using Post Office Cash lodged via card at Post Office 0.64p per 100 Cash withdrawal via card at Post Office 0.58p per 100 Cash lodged without card at Post Office 0.64p per 100 BACS Business On Line Bulk Payroll/Creditor Payments 12p each Business Pay Set up Charge (by number of payees) employees employees Up to 100 employees Addition (per payee) 1.00 Amendment (per payee) 1.00 Payment (per payee) 30p Quarterly Maintenance Charge 5.00 * Charging month - the 5th of one month to the 4th of the next. ** You may be charged for using some cash machines by the ATM provider. This will be clearly stated on relevant ATM machines before you proceed with your transaction. 4 Bureau/BACS Submissions File submitted via Bureau/BACS - Direct Debits Collected 10p each - Third Party Payments Made 10p each - Excess over approved BACS limit per excess Other Bank Charges (these do not qualify for free banking) These Charges are applied to your account when you make use of the services to which they refer. Cheque Unpaid/Direct Debit - inwards 6.50 Cheque, Direct Debits, Standing Order Unpaid - outwards CHAPS Transfer (Sterling) Bank draft (Sterling) Certificate of Interest/Balance FREE Duplicate Certificate of Interest/Balance 6.00 each Cheque Book FREE Cheque retrieval/copy cheque (for each cheque or group of cheques paid on same day) 5.00 Special cheque presentation 8.50 plus For telephone confirmation 3.00 min Direct Debit mandate set up 2.50 Standing Order Amendments 2.75 each Stop Payment Instruction - Cheque Direct Debit 2.75 each Accountant s requests (for audit details) min, max (+VAT) Status Enquiry VAT Management Charge per hour Statements Copies of past statements Issued to additional recipient Transaction details on request More than one statement in a month 6.00 per sheet 3.00 per sheet 2.00 per page 3 per statement Charges for management time will be applied by reference to workload and time involved in dealing with your account. Any Charges will be advised to you in advance. This is our standard Tariff of charges for your accounts held at the UK Branch of Silicon Valley Bank. It sets out the prices that we charge you for our most frequently used account services in the UK. Account and service fees for your Business and Agribusiness. January 2016 Account fees Account fees Account fees are subject to change at any time. Where applicable, account fees are in addition to all. Tariff of Mortgage Charges Post Office mortgages are provided by Bank of Ireland UK. Bank of Ireland is closely involved in the mortgage industry s initiative with the Council of Mortgage Lenders and Which?